Inadvertent escalation or Chinese expansion? Two very different fears compete for attention in the proliferating discourse on the risk-rich imbroglio of the South China Sea. Some fear an inadvertent escalation that may unnecessarily trigger war. Others fear Chinese expansion that prepares for its hegemony. Only Xi’s China cultivates a priority fear of American expansion. Many of China’s neighbors are more concerned that a US withdrawal could leave a vacuum that only Chinese dominion could replace. In fact, as their anxiety toward China grows more intense, they appear to hedge against Beijing more than they hedge against Washington. Diplomacy on the South China Sea since the 1990s has been a process of learning from disillusionment for these Southeast Asian capitals. China’s escalatory actions and a paucity of deterrent responses by the United States have lessened fears of war and raised, instead, fears of appropriation. The question now is whether their latest preoccupation with Chinese expansion is too late, and on too small and too tentative a scale, to slow the progress of increasing Chinese control. Step by coercive step, President Xi Jinping is deleting the “Sea” in “South China Sea.” If he or his successor fully succeeds, that body of water and its many land features will be governed by China, no longer in ambition but in reality. Then, by the daily exercise of Chinese prerogative, the South China Sea will have become “South China” full stop—a Chinese lake. Access to the lake and usage of its contents by other shoreline states will then depend on whether China chooses to welcome or reject them, and how deferentially they behave toward China in the hope of earning its favor. China identifies three sets of land features in the South China Sea: Xisha (the Paracels), Nansha (the Spratlys), and Zhongsha (Scarborough Shoal, Macclesfield Bank, and smaller features in their vicinities). Under Chinese law, the province of Hainan already incorporates these lands and, by extension, the waters within and around them inside the notoriously broad, never clearly or consistently explained “nine-dash line”—now including a tenth dash added east of Taiwan. In March 2012 at the Jakarta International Defense Dialogue, I suggested to a uniformed officer in the People’s Liberation Army that it would help if China could clarify the meaning of those nine dashes. Did the broken line denote Chinese sovereignty “only” over the land features within its bounds? Or over those features plus the sea itself, the air above it, the fish within it, and the hydrocarbons underneath? The officer’s answer amounted to a combination of “be careful what you wish for” and “let sleeping dogs lie”: Precisely because we own everything inside the line, he implied, you should thank us for not saying what we truly mean. A month later, despite saying little, China did what it meant by outmaneuvering the Philippines at Scarborough Shoal and taking effective sole control of that land feature. Surface ship activity around Scarborough Shoal in April 2016 suggests that Beijing may further demonstrate what its nine-dash line means by turning the land feature into a third base, following similar precedents in the Paracels and the Spratlys. If that happens, Xi’s China will have erected a strategic tripod connecting platforms in northwestern, southeastern, and northeastern waters—a quasi-military structure that China can use to conduct maritime and airborne reconnaissance, while projecting power beyond its continental borders, and coercing deference to Beijing in the capitals of littoral Southeast Asia. China’s rapid and extensive construction of runways, ports, and emplacements in the South China Sea has falsified two reassurances once voiced by observers: first, that China has no strategy and intra-bureaucratic differences make one unlikely; second, that controlling “a bunch of rocks” will not matter because they can be “taken out in minutes” by American aircraft. Xi’s China in fact does have a strategy: to claim control over the South China Sea and then gain it, incrementally, without provoking physical war. And so far, the strategy’s remarkable success stems in large measure from Beijing’s keen awareness that their dredged ports and paved airstrips cannot be “taken out” by Washington without triggering a deadly Sino-American showdown that the Americans, already mired in the Middle East, do not want. The question is therefore no longer whether Xi’s China seeks hard-power sway in the South China Sea, but how far it will go to realize that ambition. The flip side of “How far will China go?” is a different query, namely, “What can the states of Southeast Asia live with?” By extension, what kind and degree of Chinese primacy in the South China Sea would the United States, Australia, or another relevant actor be willing, if reluctantly, to accept? By further extension, what, if any, limits on its primacy would China accept? Understanding and comparing these “(dis)comfort zones” might be helpful in making multilateral initiatives more realistic and, thus, more likely to succeed in forestalling, delaying, or, if China’s moves preclude those goals, at least moderating eventual Chinese control. Degrees of maximalist Chinese nationalism are easy to infer from Chinese behavior. The dredging of ports, the building of runways and structures, the placing of missiles, the ramming, the water cannons, the “indisputable” sovereignty, the manipulation of policy discord within Southeast Asia, the refusal to agree to regulate conduct even in a declaration let alone a code . . . On a dial of likely Chinese strategic intent, these activities hint toward full primacy over the South China Sea. What might such an end-condition look like? Primacy and savagery are not the same. One can rule out a grotesquely Sinophobic caricature of China running amok through Southeast Asia, invading countries, assassinating leaders, haphazardly acting out paranoid whims while absorbing the South China Sea into a “co-prosperity sphere” based entirely on predation. Instead, under a plausibly long-run maximalist-nationalist scenario, domestic Chinese laws will be applied on a daily basis across all or nearly all of the vital global waterway, and their application will, first and foremost, serve China’s interests as defined in Beijing. Disinviting the US Navy from the South China Sea is something Beijing wishes to be able to do. But Xi’s China seems certain not to risk war in a surely futile and plausibly catastrophic pursuit of that goal. Rather, China deems it more expedient to patiently and gradually cultivate Southeast Asian deference through generous economic diplomacy and cooptation; to wait until such deference can eventually engender support for a Chinese security guarantee, one in which the Southeast Asians, other things being equal, will consider either desirable or inevitable—ideally both. Other things are however not equal and they will not be equal. Yet, noting the possible existence of such a fanciful scenario in the farther reaches of Xi’s “China Dream” does usefully open a question worth pondering: What if China does someday control the South China Sea? How benign or malign will Pax Sinica be? How much is Chinese control over the maritime heart of Southeast Asia likely to matter, in what ways, and with what implications for the foreign policies of Southeast Asian states? How those governments respond to Chinese expansion will be intently followed in Washington. Americans remember all too well what can happen when their government wants something more than the people on whose behalf they want it. Among present actions and transactions in the South China Sea, commercial transport is likely to be impacted least by Chinese expansion. Container ships on innocent transit of the lake to or from China’s mainland will be free to proceed. So will trading vessels straightforwardly plying other routes. Exceptions may occur, but only if and when Beijing decides to punish the owner of a ship or cargo for an offense to China deemed greater than the risk of retaliation. If China’s domestic laws were someday to be implemented along the entire “nine-dash” line, through satellite surveillance from above and sea patrols below,1 one could imagine commercial traffic having to comply electronically with any notifications, payments, or other obligations that China might choose to impose. Analogously, the censorship of commercial Internet sites and services by the Great Firewall is already an impediment to trade.2 But cyberspace and seaspace are radically different media, and Xi and his successors will think at least twice before shooting their economy in its newly acquired maritime foot. Compared with commercial transit, access to the sea’s resources will be more restricted in a South China Sea under Chinese sway. Updated domestic regulations that came into effect on January 1, 2014, require non-Chinese fishing crews and ships to obtain China’s permission before operating within an apparently vast space in the South China Sea. Under the law, disobedient vessels may be forcibly expelled, seized, impounded, and fined. Time and again I have read or heard Chinese officials claiming that China has neither interfered, nor will interfere with freedom of navigation. Unspecified are the coercive measures already taken by Beijing to deny the freedom of foreign fishermen to navigate to and from the fish—measures that tether such freedom to Chinese consent, under Chinese law. The apparent absence of an official border raises many questions. Absent a clear line of demarcation that forbids the foreign fishermen from crossing without Chinese permission, how can they know whether they are violating Chinese law? What does this omission—possibly a self-defeating one—imply? Could one infer from Beijing’s current silence a laudable openness to someday negotiating the boundary with the foreign states to whose vessels Chinese laws would apply? Has Beijing decided on its own that the fishing boundary should be the nine-dash line, but will not say so lest those dashes be rendered even more controversial than they already are, not to mention the operational inconvenience of having the dashes broken by stretches of unlined water inviting unauthorized entry? Does Beijing seriously believe that those unexplained dashes, which lack coordinates and whose locations have changed over time,4 are compatible with the United Nations Convention on the Law of the Sea (UNCLOS)? The government of Hainan province is administratively responsible for the South China Sea. Has clarification on the limits of the permit-only fishing zone been delayed because Beijing and Hainan disagree on where the line ought to be drawn? Has China chosen to emphasize the land features instead—Xisha, Nansha, Zhongsha—as part of a contingency plan to trade the dashes for a sea boundary to be derived under UNCLOS from the differing configurations of seaspace that accrue from different land features according to international law? Does the failure publicly to delimit the zone illustrate a desire to keep foreign fishing states off-balance while China acquires the enforcement capacity to implement the no-entry-without-permit rule—and if so, will this be achieved through an expanded naval and coast guard presence, including state-enlisted-and-armed “private fishing” vessels operating in consort with land-feature-aided surveillance within and, if possible, beyond the nine-dash line? Or is it that the lines on maps just do not matter to action-prone maximalists in Beijing? I ask these questions not to answer them. I do not know the answers. I ask them to emphasize the key role of the ambiguity in China’s broader strategy regarding the South China Sea, and not only as regards the nine-dash line. China today lacks the physical means to exclude all foreign fishermen and ships from its permit-only zone. Why would China declare what it could not execute? Would that not place its own credibility at risk? Arguably, instead, Beijing is campaigning what it cannot yet implement in order to accustom lesser states now to its planned reality later—incubating deference before enforcement. Note also the ambiguity surrounding the nine-dash line. Does it encompass both sea and land, or land alone? Both answers are equally probable at this point, and China keeps its options open. A different illustration of Beijing’s use of ambiguity affects its relations with Jakarta. Indonesia is by far the largest Southeast Asian country, but that has not emboldened its leaders to challenge China loudly and consistently over the South China Sea. Denying itself the role of claimant, Jakarta has kept its diplomacy quiet. Indonesian officials have been careful not to publicize the overlap between their country’s Exclusive Economic Zone (EEZ) and China’s nine-dash line. Their attitude has both encouraged and reflected complacence. Their discretion has helped to save China’s maritime “face” while protecting Indonesia’s own dispassionate position above the fray of claims and, thereby, preserving its possible future role as a go-between, arbiter, or conciliator. China has not returned the favor. On at least two occasions, to my knowledge, Indonesian officials at a high level have privately asked their Chinese counterparts for assurance that, despite the overlap, China really does accept the legality of Indonesia’s EEZ under the UNCLOS. In those off-the-record conversations, the Chinese told the Indonesians not to worry but refused to put that reassurance in writing. Beijing is highly unlikely to address the overlap by publicly indenting the nine-dash line to accommodate Jakarta. In apparent violation of the UNCLOS, China’s line cuts deeply into the EEZs of every Southeast Asian country. Beijing must know that conceding seaspace to Indonesia could prompt the Philippines, Vietnam, Malaysia, and/or Brunei to demand concessions of their own. If granted, those requests would shrivel the line and with it the implied scope of Chinese ambition. Meanwhile in Jakarta, Indonesian officials have preferred residual ambiguity—nothing in writing—to a public spat in which they would lose face and eligibility for a neutral-broker. The risk of Chinese retaliation has made silence all the more attractive. The article is irrelevant because China is in physical terms not “immediately adjacent’ to Indonesia. Nearly a thousand nautical miles separate Natuna from Hainan. As for adjacency in law or consensus, China does not and will not border Indonesia in those terms either, pending global legal or practical recognition China’s appropriation and domestication of the South China Sea all the way to Natuna—an improbable capitulation for now. Even if the Kway Fey was fishing in Indonesia’s archipelagic waters rather than in its EEZ, China was not its next-door neighbor. The UNCLOS (Part V, Art. 56, 1a) does allow Indonesia to give “sovereign rights” to other states to fish in its own EEZ. But the Kway Fey was not given such access. There was no “bilateral agreement” of legal standing that clarified the relevant overlap in seaspace. China itself had chosen “purposeful ambiguity”5 over any agreement for placement on the public legal record—a choice most likely motivated by Beijing’s desire not to jeopardize the other dashes in its claim by openly ceding the off-Natuna overlap to Indonesia, and by Jakarta’s unwillingness to publicly relinquish that piece of seaspace to China. Indonesia unloaded all but one of the crewmen on the Chinese boat and transferred them to Indonesian soil, where they face a judicial proceeding as provided under the UNCLOS (Part V, Art. 73, 1). By ramming the boat out of Indonesia’s grasp, China’s coast guard managed to keep the Kway Fey in Chinese hands. But in the perceptions of Indonesians, the resulting image of China is one of Coercer, as opposed to China the Partner. The Natuna incident is not a game-changer. President Joko Widodo (“Jokowi”) will not risk endangering economic relations with China by adopting a hard-line stance toward Beijing over the South China Sea. Ambiguity east of Natuna, for the time being, is self-induced by China and Indonesia alike. In January 2013 Manila “sued” China over the nine-dash line and the status—reef, rock, or island—of particular land features under the UNCLOS rules. In a matter of months, the arbitral court that has been deliberating these matters in The Hague will issue its decisions. China will reject the court’s authority if the decision is unfavorable. But how will the other claimants respond? One can hope that they will not champion their partisan claims. They should instead seek the beginnings of a new regional consensus, especially if, as many expect, the court delegitimizes the nine-dash line. In that likely event, every claimant should be urged to recalibrate its claims to make it compliant with the UNCLOS as interpreted by the court. Nongovernmental actors in Southeast Asia should explore their “(dis)comfort zones” to arrange an equitable sharing of access and resources that would include an appropriate share for China, which is, after all, by far the largest littoral state. All of the coastal countries have a stake in managing the sea’s diminishing stocks of fish. Indonesia’s response to illegal fishing in its waters has been fierce. Since its inauguration in 2014, Jokowi’s government has destroyed some 150 (mainly Southeast Asian) fishing boats caught poaching in Indonesian waters. The trick will be to transform that nationalist response into a regional awareness of the problem that could foster a regional solution. It is wishful to think that Southeast Asians alone will be able to overcome their own differences and rivalries and proceed jointly to solve the “China problem,” which of course cannot be solved without involving Beijing. Beijing’s dilatory bilateralist tactics have shown, however, that the imbroglio also cannot be solved with Beijing’s involvement, not unless the entire frame of consultation is enlarged to include the participation or at least the active support of users alongside claimants. In this context, a shift from ambiguity in Chinese ambition toward clarity on behalf of fairness and conciliation will require a concomitant shift by the Southeast Asian states. They urgently need to settle their own clashing claims. Such unfinished business merely enables Beijing to avoid facing a united or even a like-minded front. Lastly, outsiders, insiders, users, and claimants alike should be thinking creatively about the kind of maritime management regime that would represent a desirable and viable alternative to Chinese control, or, if it really is too late for that, a moderation of relative Chinese primacy—not in South China the lake, but in the South China Sea. 1. See Andrew Chubb, “China’s Expansion of ‘Regular Rights Defense Patrols’ in the South China Sea: A Map, Courtesy of CCTV,” September 4, 2014, https://southseaconversations.wordpress.com/2014/09/04/chinas-expansion-of-regular-rights-defense-patrols-in-the-south-china-sea-a-map-courtesy-of-cctv/. 2. For this argument, see Paul Mozur, “US Adds China’s Internet Controls to List of Trade Barriers,” The New York Times, April 8, 2016, B3. 3. See especially the careful acknowledgment of uncertainty in Isaac Kardon, “Hainan Revises Fishing Regulations in South China Sea: New Language, Old Ambiguities,” China Brief 11, no. 2 (January 17, 2014), http://www.jamestown.org/programs/chinabrief/single/?tx_ttnews[tt_news]=41836&cHash=92ea9a23748ea174f7a3d452a9c44770#.VwlQCnD1bko. The zigzag course of the Chinese patrol mapped by Chubb (above) does roughly parallel the six southeastern dashes in the nine-dash line, but not the northeastern three. 4. United States Department of State, “China: Maritime Claims in the South China Sea,” Limits in the Seas, Bureau of Oceans and International Environmental and Scientific Affairs, December 5, 2014, p. 8 (Map 5), http://www.state.gov/documents/organization/234936.pdf. 5. Shannon Tiezzi, “Would Indonesia Actually Challenge China’s Nine-Dash Line in International Court?” The Diplomat, November 13, 2015, http://thediplomat.com/2015/11/would-indonesia-actually-challenge-chinas-nine-dash-line-in-international-court/. 6. Manuel Mogato, “Philippines, Vietnam to explore joint patrols in South China Sea,” Reuters, April 13, 2016, http://www.reuters.com/article/us-southchinasea-philippines-vietnam-idUSKCN0XA0N2. Since the author addresses only the view from America, let’s take a peek from China’s point of view. The US has been attacking China physically, politically and propagandistically for 50 years. It created and nurtured the largest aircraft carrier on earth, Taiwan, and surrounded China with nuclear armed bases, aircraft and vessels. It strives daily to subvert and disgrace China’s government and, thus, to overthrow it. This is the provocation stage. 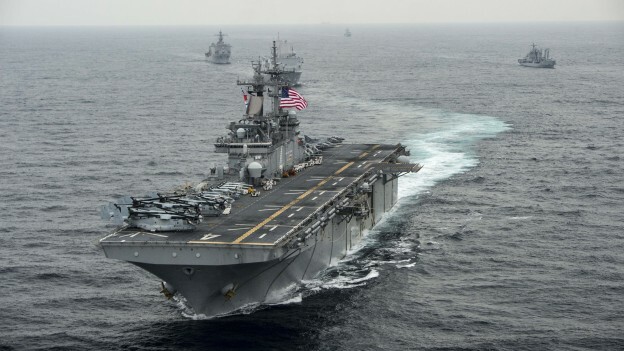 China responds to this program of attacks and threats by warning Taiwan and establishing (fewer, smaller and later than any other claimant) installations on some local marine features. In so doing, China injures nobody and deprives nobody of assets to which they have any clear claim. This is the reaction phase. The US now attacks China for ‘aggression’ and lawlessness and calls upon the world (those 40-odd countries which it militarily occupies) to join in expressing their horror at the Chinese actions. This is the de-ligitimization stage. It is standard operating procedure for our current foreign policy and is applied to any country deemed to have independent ideas or policies. It requires immense hypocrisy and a demonstrated willingness to destroy any nation that resists it. Most importantly, it is failing. We are becoming international pariahs, sponsors of kidnapping, assassination, terrorism and war. The Chinese approach is diametrically opposite of ours (despite our portraying it as similar to our own). It is winning. If we do not wake up to what’s really happening in and around China – and respond appropriately – in as little as ten years the USA will be no more relevant to world affairs than the EU today. Articles like this simply defer our day of reckoning.